So why do I Really wear this? What is it that compels me to cast my eyes across the many models I could choose from, only to succumb to the subconscious needs to wear what I believe to be the holy grail of watches? MY Holy Grail! I questioned whether it was the subconscious strength It offers me, or the empowerment it affords me the instant it hits my wrist. That sense of power it transfers to me, offering such irresistible desire that you just have to take a sneak look at the timepiece when you think nobody’s watching? The hidden comfort it affords, the metamorphosis of cold steel to skin temperature the instant it’s put on. There’s so much I could say about it, so many reasons to give to justify wearing what I openly concede to be MY holy grail of watches. The finest of nuances are what does it, the 60 clicking sounds of the bezel so finely crafted, the hypnotic power of the second hand as it moves effortlessly in it’s attempt to put me into metronomic trance. Yes, that’s it; it’s my Spirit Guide, my guardian, and my keeper of time. Time we all know rests so precious upon one’s hand. It is… The 1969 Citizen “Chrono Master 500m Diver”, of which there is nothing to compare! It is a piece of such importance to me I can safely say it’s the one! The Grail, one that none other will ever beat! Truthfully, the realist in me accepts that one can never give a closed title to any watch, there will always be another to come and steal your heart, your soul, your very being. Why did I not choose the predictable, the Rolex Submariner, or some other grandiose watch? Because nothing else could give me the story a watch should give. (Read about the Citizen 500m Diver HERE ) I’ll tell you why? I simply couldn’t. Even with all it entails, the Rolex to me can never capture the sense of spirit that is held in the above. You see buying a watch isn’t always about money. Anyone with money can buy a ‘Rolex’, but can they buy the passion of the story behind it? In my case it can’t. Yes, it’s true you have to posses some level of wealth to obtain the Citizen 500, but that isn’t always enough. You have to possess fortune, luck, a blessing, call it what you will. I call it fate. This was destined to become mine, my keeper of time. Having that knowledge I’m in possession of my guardian angel I no longer fret or worry about when, if, how am I ever going to get my hands on such a treasure. I already have, and that’s the strength behind my loyalty to this particular model. Waiting patiently sometimes not so, I knew my time would come, and come it did. My waiting paid off, and many a lesson learnt in the process of my waiting. I was taught the concept of perseverance, the will to fight, to never give up on any given cause. The watch is more than just a watch; it’s my journey. A journey that saw several watches passes through my grasp. But my perseverance paid off; for despite those few for sale over the time; with only two of these being 100% original, (needless to say I bought them both…) That is why I award my Citizen 500 the title I bestowed upon it. There will never be another watch, or brand that will replicate the feelings I endured during my quest to own the Citizen 500, the thrill of the chase, the disappointments, the ultimate euphoria I felt when I eventually took possession of my cherished goal. It is what encompasses the very self of me, my spirit, my determination, my very soul. My spirit went into the chase for my Mecca of watches, the reason I now call it ‘my Spirit watch’. It holds the very essence of me which when I look at it on a daily basis I’m constantly reminded of. This watch will be carried with me through the rest of my journeys. It will experience the thrills I’ll no doubt encounter when looking for another prey in the ever-growing desire to build the best Citizen Vintage Collection possible. It will never have a price tag on it, never be for sale, it is mine. It is my Spirit Watch. 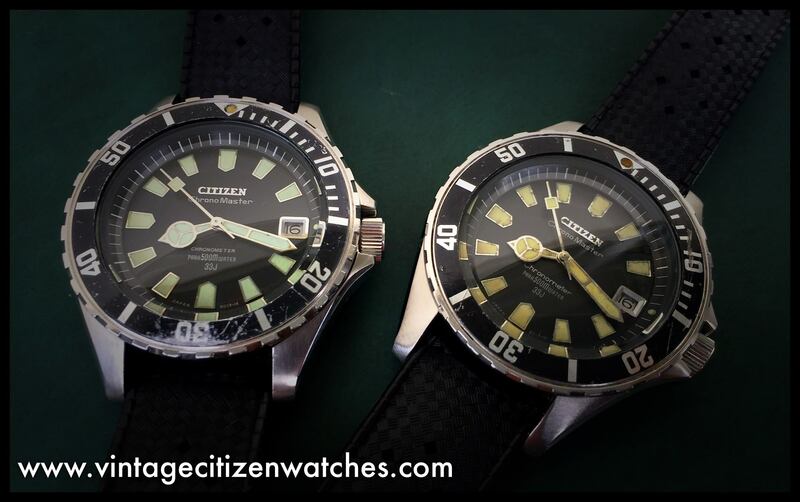 This entry was posted in Citizen diver, parashock, parawater, Uncategorized, vintage Citizen and tagged citizen 500m diver, citizen diving watch, citizen vintage diver, Citizen watch, Diving watch, exit watch, grail watch, rolex submeriner, vintage citizen watch, vintage diving watch. Bookmark the permalink.